When Laura Thomas first qualified as an nutritionist, she saw clients on a one-to-one basis. She soon recognised a trend. "A lot of them were eating the right sorts of foods like avocado and salmon and all that, but their relationship with food was in tatters," she told BBC News NI. Giving her clients the "perfect" meal plan would have aggravated the problem, she said. Ms Thomas received her PhD in nutritional sciences from Texas A&M University and carried out postdoctoral training at Cornell University. In 2016, she then went on to train in what's known as 'intuitive eating'. 'Clean eating': How good is it for you? In a nutshell, intuitive eating is an anti-diet that encourages people not to base food choice on diet plans or health-food trends. "I think people are fed up being told that they have to eat clean," Ms Thomas said. Tom Quinn, director of external affairs for the national eating disorder charity Beat, said the trend of classing certain foods as "bad" or "good" can cause distress to people who are suffering from an eating disorder or vulnerable to developing one. There are more than 63 million posts on Instagram under the hashtag "fitspo" - short for fitness inspiration. Almost 44 million Instagram accounts have posted with the hashtag "healthylifestyle". The hashtag "cleaneating" has been added to more than 43 million posts. A quick scroll through these posts show sculpted bodies and perfectly-crafted healthy plates captioned with nutritional information. Some of the more popular accounts have used their social media following to release books, apps and launch online fitness coaching businesses, but there are concerns about the credentials of the people behind such accounts. Now, registered nutritionists have taken to social media platforms like Instagram to debunk a lot of dieting rules and myths, posting under the hashtags "intuitiveeating" (882,100 posts) and "mindfuleating" (546,800 posts). "I think there's a general misconception about the relative importance of nutrition in our lives," said Ms Thomas. "It's not to say that nutrition isn't important, it's just not the be all and end all." Danielle McCarthy is a PhD-qualified nutritionist registered with the Association of Nutrition and is based in Belfast. While diet obsession is nothing new, she said, what is new is the access to a plethora of new ideas about what it means to be healthy. "I worked with mothers who were removing food groups from children's diets," she said. These things come from exposure to food trends. Claire Feldman, who has a diploma in nutrition and lifestyle coaching from the Institute of Health Sciences in Dublin, said she has also noticed more posts under the hashtag "mindfuleating". "It's become a bit of a buzzword," she said. But Mr Quinn said that more research is needed to determine the impact of social media on people's recovery, as well as the risks it poses. He said that intuitive eating might not be the best first step for someone recovering from an eating disorder. "Since eating disorders often distort people's hunger and satiety cues, and place restrictions on what the person feels able to eat, intuitive eating can be difficult," he said. "For people in recovery from an eating disorder, meal plans are often used in treatment, rather than reliance upon intuitive eating." As a teenager, Colette Lydon was battling with bulimia nervosa, an eating disorder. She first started her Instagram account for "healthy eating". Looking back, she said her obsession with what other people were eating - and how often they were exercising - was far from healthy. "Photographing your healthy eating habits can be a status thing - that what you eat and what you weigh is what you're worth," she said. The growth of body positive and intuitive eating Instagram accounts are a positive development, she said. "I think a lot of people were angry and looking for an alternative, something that tells you that you're fine the way you are," she said. Ms Lydon now volunteers with Eating Disorders NI and posts about her experience recovering from an eating disorder on Instagram. "It's about not caring whether your stomach is sticking out or not and getting on with your day," she said. "That's the end goal." As interest in intuitive eating on social media grows, Ms McCarthy said she worries the concept could be misinterpreted and used for commercial gain. "When something becomes a trend, organisations and businesses try and align it to the work they do," she said. "Someone could easily start using intuitive eating like a rule." 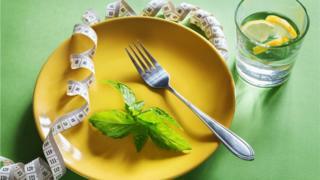 Ms Thomas agreed: "Intuitive eating can get watered down and appropriated by diet culture. "I think there is real versus fake intuitive eating, some try to interpret it as a hunger and fullness diet. "It's a lot more complicated than that." What does the NHS say? Diet debate: Low-fat or high-fat - does it matter?